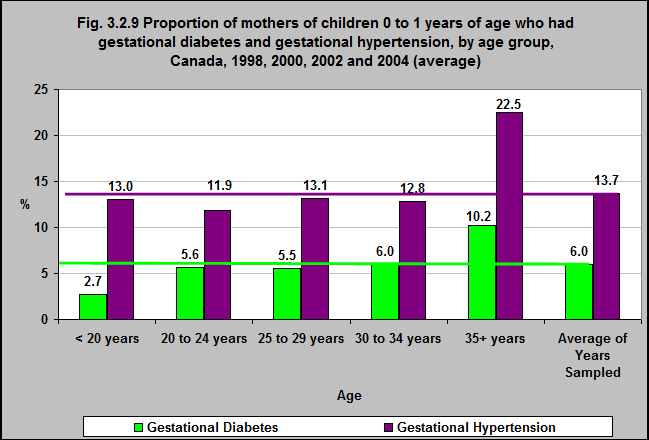 Source: CICH graphic created using data adapted from Statistics Canada, 2008, “The Children of Older First-time Mothers in Canada: Their Health and Development”, Children and Youth Research Paper Series, Catalogue number 89-599-M. http://www.statcan.gc.ca/pub/89-599-m/89-599-m2008005-eng.htm – accessed July 26, 2017. In the combined years of 1998, 2000, 2002 and 2004, 6% of mothers of children 0 to 1 years had gestational diabetes during their pregnancy. Almost 14% had gestational hypertension. The incidence of gestational diabetes appears to have increased with increasing maternal age. The incidence of gestational hypertension was relatively similar for women less than 34 years, but spiked to 22.5% among women over 35 years of age.